Attendees of NRF's Retail Big Show Expo can preview a new mobile cash wrap with ArmorActive’s Surface Pro enclosure at the Microsoft Booth #2703, locate on Level 3, January 13-14. This week ArmorActive partners with Microsoft at the National Retail Federation’s annual Retail’s Big Show 2014 Expo in New York to feature a mobile cash wrap integrated with the Surface Pro. As the leader in Microsoft Surface kiosks and enclosures, ArmorActive was selected as the most suitable candidate to produce a custom enclosure featuring Microsoft’s flagship tablet. This Surface Pro enclosure is built with durable steel front and back plates, and layers of durable clear acrylic in between to give the presentation a unique look. The enclosure is mounted to the counter by a steel post that features 180 degree rotation and a friction hinge allowing the user to adjust the viewing angle. 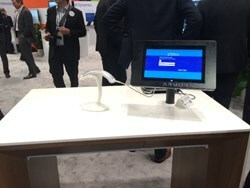 Microsoft’s mobile cash wrap also features 2D barcode scanner, Verifone credit card terminal embedded into the counter, and a receipt printer integrated into the bagging area. ArmorActive’s appearance at Microsoft’s NRF booth is the result of their participation in Microsoft’s breadth partnership program. This partnership mandates 3rd party products are designed to the precise specifications set by Microsoft, and enables ArmorActive to advertise “Designed for Surface” on packaging and marketing materials. As the Microsoft Surface continues to gain market share in the business sector, the demand for a Surface Pro POS system continues to grow rapidly. ArmorActive has been, and will continue to be on the forefront of enclosures and kiosks for tablets such as the Surface Pro. Attendees of this year’s Big Show Expo can find the mobile cash wrap with ArmorActive’s Surface Pro enclosure at Microsoft’s retail sales lane on Level 3, Booth #2703, January 13-14. ArmorActive specializes in purpose-built solutions for deploying tablet computers into any business landscape. Our goal is to provide the highest quality of service to every customer with our team of account managers who understand every phase of a tablet deployment, no matter how large or small the scale of the project.